130 days. The standard variety for home gardens. Stems average 1½ x 8-10 in., well-blanched from the base upward. Good variety for overwintering, hardy to at least 10°F. Pkt. 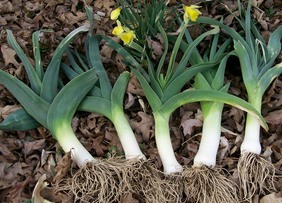 Please refer to Leek Growing Guide for cultural information. Packet: 3g (approximately 1100 seeds) sows 40' direct-seeded or 120' as transplants.